Letters to Santa Mailbox is a wonderful addition to any Christmas display. The door opens at the bottom to collect the letters. 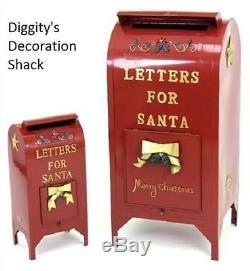 This fully functioning mailbox is a fun addition for children to drop of their letters to Santa Claus. Dimensions are: Large - 46" H X 18" W X 21 L. Medium Mailbox dimensions are: 11" L X 9" W X 25 H. The medium size box is great for smaller children to reach or set on a counter top. The item "Letters for Santa Mailbox Christmas Decoration Indoor/Outdoor Christmas Decor" is in sale since Saturday, February 25, 2017. This item is in the category "Collectibles\Holiday & Seasonal\Christmas\ Current (1991-Now)\Other Current Christmas Décor". The seller is "diggity109" and is located in Hazleton, Pennsylvania. This item can be shipped to United States.